I went to the grocery store. The boy has fruit again, and his favorite pocket bread. All is well in his world. 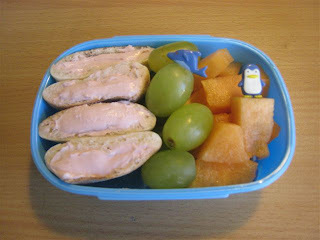 He, of course, wanted one of his favorite snack combinations for school. He had mini pitas stuffed with strawberry cream cheese, green grapes & canteloupe chunks. We used a couple of cute new picks from my friend Chrystyna to make it a bit cuter. Who doesn't like penguins & dolphins? Love the penguin pick!!! So adorable. What kind of mini-pita pockets are those? I bought some from Trader Joe's awhile back and had a hard time opening them without them splitting all apart. We always by Toufayan mini pitas (pitettes?) at Kroger. They come in whole wheat or white and are HFCS free. Major dietary staple when we are in Texas, I found a different option in Canada, mini sliders.